Call 01189 331242 for more. Affordable access to indoor and outdoor signage. Gain versatility and enjoy convenient printing of indoor and outdoor jobs with the HP Latex 335 Printer. This affordable printer delivers print jobs fast, using healthier Latex water-based inks¹ and produces durable, scratch-resistant prints comparable to hard-solvent inks. Large high quality prints and with eco standards with the new Water-based HP Latex 335. Achieve high image quality at a high productivity that also interacts with HP Latex Inks to rapidly immobilize pigments on the surface of the print. Building on years of third-generation the best-selling sign and display printers ever are back with all-new technology assets. The new HP Latex 335 Printer delivers high image quality, productivity and durability, as well as environmental benefits and industry certifications, all now synonymous with water-based HP Latex Ink Technology. Win new clients on eco standards - UL ECOLOGO®, UL GREENGUARD GOLD Certified inks; prints meet AgBB criteria. Offer more—print on traditional signage substrates and beyond—up to 1.63m (64in). Reach new indoor spaces that solvent can’t, like healthcare—water-based HP Latex Ink prints are odorless. Increase production time and reduce time monitoring the printer—automatic, reliable, low-maintenance printing. Achieve high image quality at high productivity that also interacts with HP Latex Inks to rapidly immobilize pigments on the surface of the print. Deliver jobs immediately with the automatic X-axis cutter. Produce high quality at speed - 13 m2 (140 ft2)/hr indoor quality with HP OMAS and HP Latex Optimizer. You can minimize damage risk - scratch resistance is comparable to hard-solvent inks on SAV and PVC banner. Use optimized profiles, customize yours—HP Quick Substrate Profiling; easy FlexiPrint HP Edition RIP inbox. Maintain high image quality over the life of the printer with user-replaceable HP Thermal Inkjet printheads. Monitor your printer remotely with the free HP Latex Mobile app. Latex inks deliver vibrant, saturated colours using lower cost medias. With quick drying odourless printing and more choice of compatible print media they will help you expand your market potential and with less operator intervention potentially reducing costs by up to 30%. Water-based HP Latex Inks combine the best characteristics of solvent inks and water-based inks. With HP Latex Inks, you can obtain outdoor durability and versatility across all common media types used in sign and display applications, together with high-quality, odorless prints, low maintenance, and health advantages6-even over eco-solvent inks. 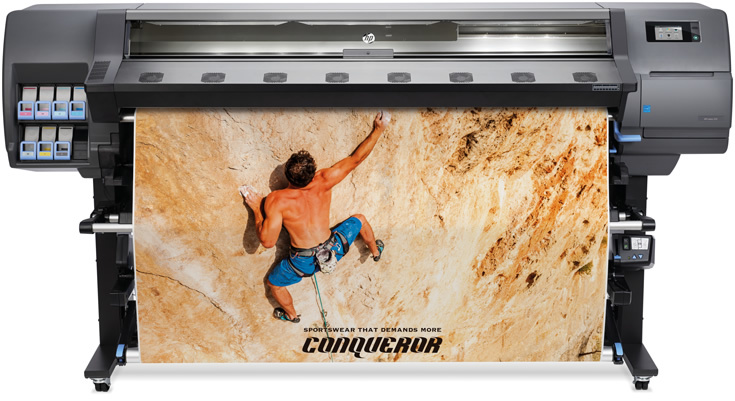 The HP Latex 335 Printer features a number of significant innovations that take you beyond the limits of eco-solvent printing, creating new opportunities to expand your business. © Copyright GDL Network. All Rights Reserved.